Last year at World of Pinot Noir, I was greatly impressed at the E16 table. While it was late in a day of tasting, and therefore my scribbled notes are nearly impossible to read (a danger even when my script is sober), they are clearly more animated than the notes from tastings before and after. Mostly I was amazed how they got access to so many good grapes and often did even better things with that fruit than more famous wineries. 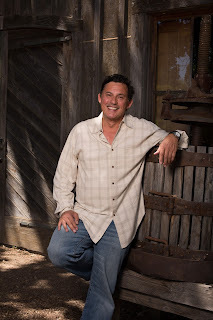 "E16 Wines is an ultra-premium, luxury producer of single-vineyard Pinot Noir and Chardonnay from California’s most sought after appellations," is the way founder Robert Jones (pictured above) puts it. "We are extremely passionate and are committed to producing exceptional wines year after year." Jones sees a new California wine landscape on the horizon. "I’m excited that Pinot Noir is starting to receive recognition as one of the world’s few great wines," he enthuses. "Cab was king, but Pinot has forged a clear path from obscurity to formidable presence. With the combination of the limited-production, small yields and its restriction to thrive in a select few corners of the earth, have distinguished Pinot Noir to emerge as world-class fruit." The world-class fruit Jones, winemaker Daniel Moore, and V.P. of Sales and Marketing Carl Grant will be pouring on Saturday will be their 2013 Anderson Valley “The West End,” 2013 Bennett Valley “Bowland Ranch,” and 2014 Santa Lucia Highlands “Upper Bench.” Jones adds, "All of these single-vineyard Pinots represent vastly different terroir and provide wonderful snapshot of three of the four appellations we produce from.